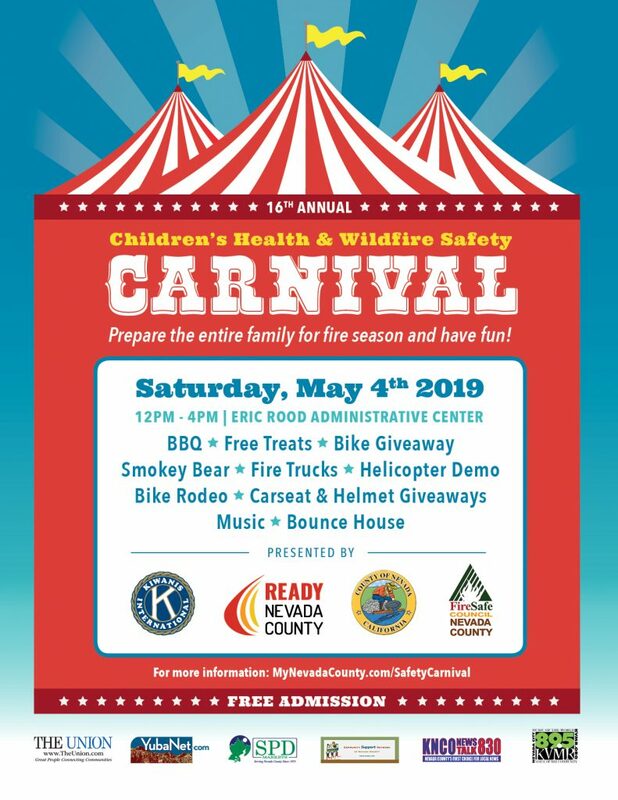 Bring the whole family out to the Rood Center on Saturday, May 4th from 12:00 to 4:00 pm for the Children’s Health & Wildfire Safety Carnival. The day will include free activities, events, giveaways, and food. Meet your local first responders, watch a helicopter demo, or saddle up for a bike rodeo. And grab a free carseat and helmet while supplies last. 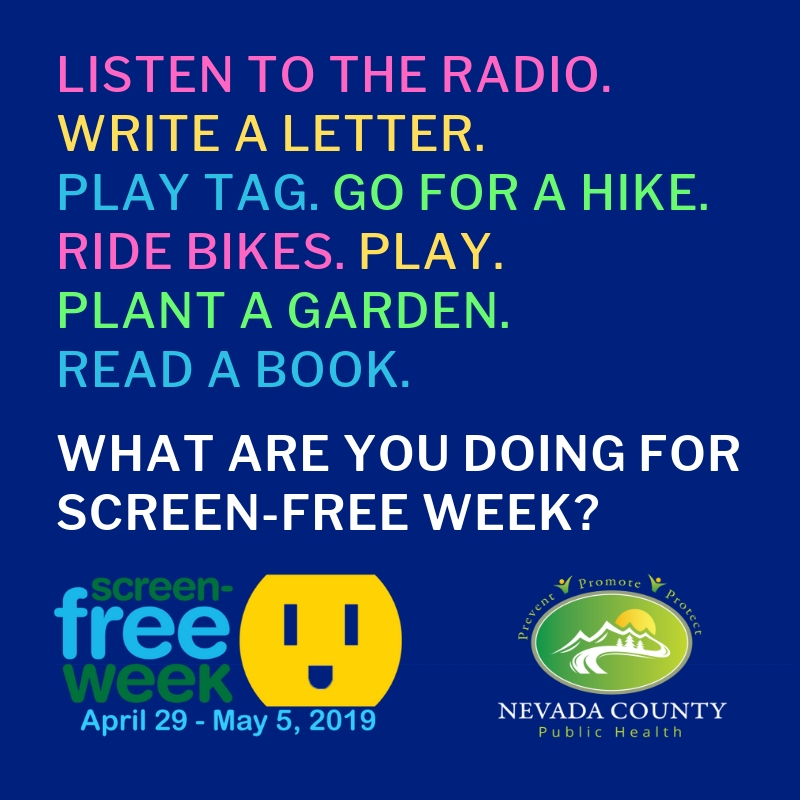 This year’s event is sponsored by the Nevada County Office of Emergency Services, Fire Safe Council of Nevada County, and Gold Country Kiwanis. Go to MyNevadaCounty.com/SafetyCarnival for more information. 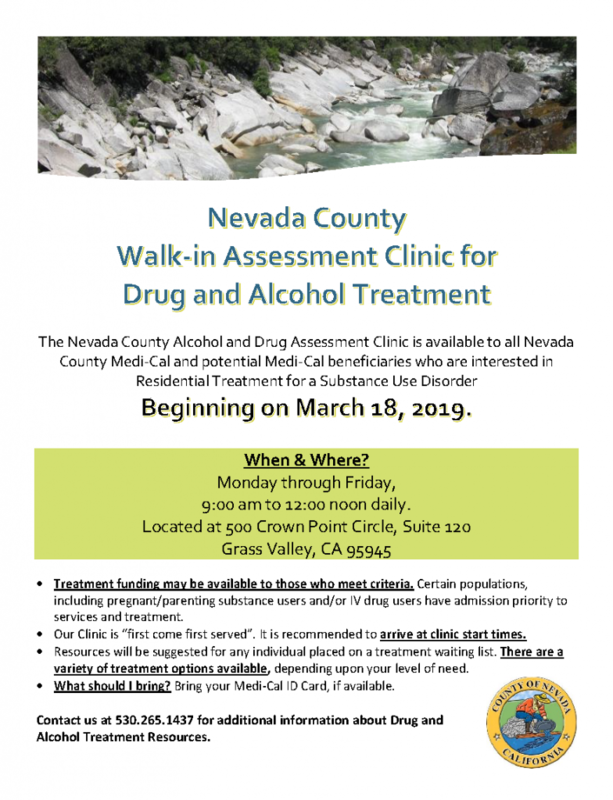 Beginning March 18th, the Nevada County Behavioral Health Department will offer a free walk-in assessment clinic for drug and alcohol treatment. The clinic is open to all Nevada County residents covered by Medi-Cal (or who may qualify for Medi-Cal) who are interested in residential treatment. 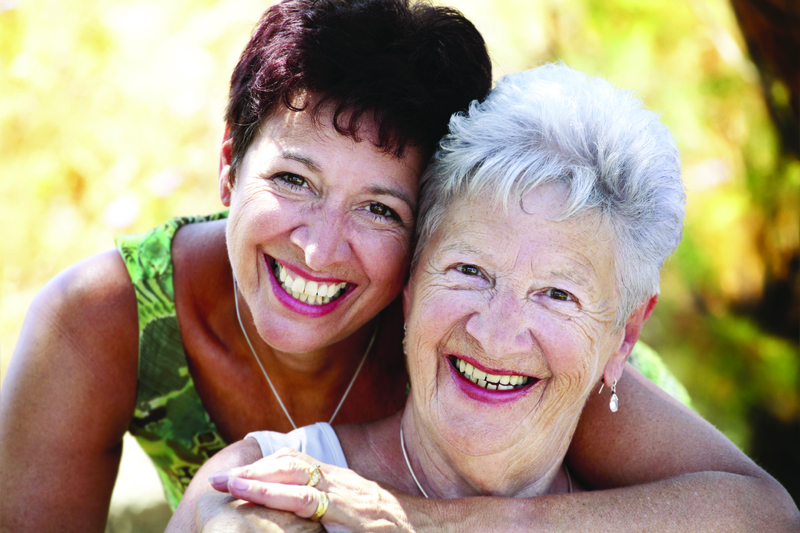 A variety of treatment options are available, depending on the level of need. Treatment priority will be given to certain populations, including pregnant/parenting people who are using substances and those using IV drugs. The “first come first served” clinic will be open Monday through Friday from 9:00 am to noon at 500 Crown Point Circle, Suite 120 in Grass Valley. Staff recommends arriving at 9:00 am. Clinic participants should bring their Medi-Cal ID card, if possible. For more information about drug and alcohol treatment resources, please call 530-265-1437. What’s Up! Wellness is hosting two upcoming trainings for adults interested in learning about adolescent mental health. The Youth Mental Health First Aid training gives participants information on how to provide initial support and resources to youth in need. 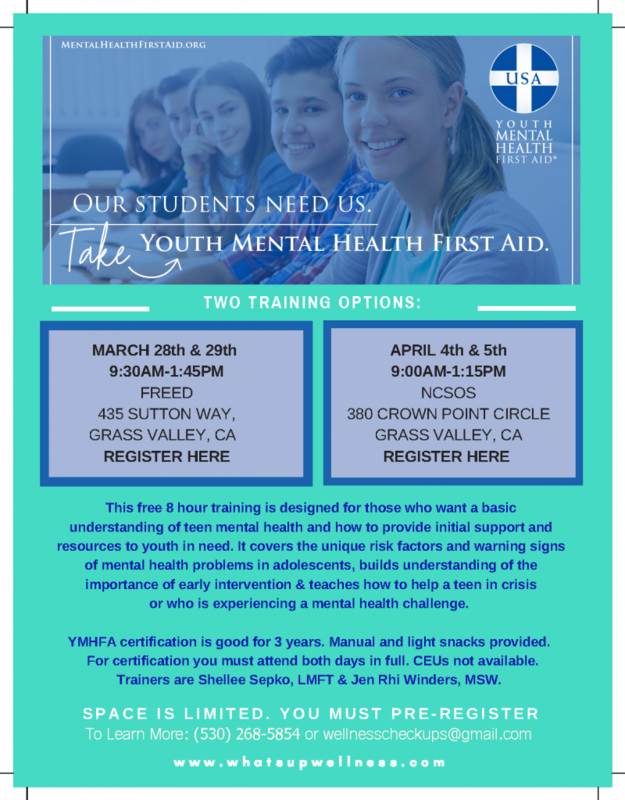 The two-day class covers the unique risk factors and warning signs of mental health problems in adolescents, builds understanding of the importance of early intervention, and teaches participants how to help a teen in crisis. Participants who complete the full eight hour class will be certified for three years. 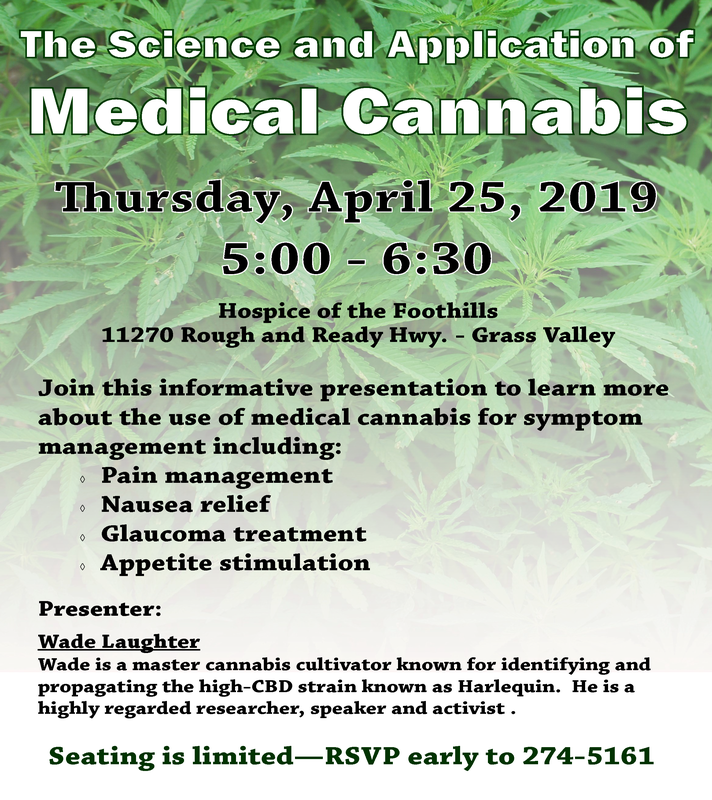 For more information, call 530-268-5854 or email wellnesscheckups@gmail.com. The Nevada Joint Union High School District is proud to present two free screenings of the award-winning film Angst. Angst explores anxiety, its causes, its effects, and what we can do about it. 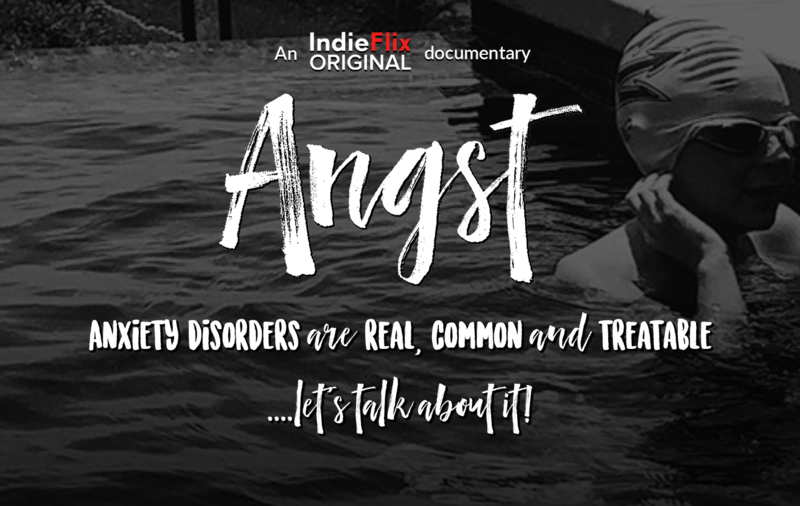 The film features interviews with kids and young adults who have or have had anxiety and what they’ve learned about it along the way. Viewers will learn more about the causes of anxiety and resources and tools available for those living with anxiety. 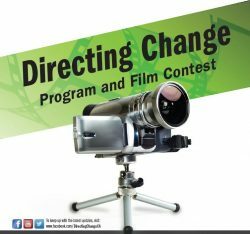 Both free screening will be followed by a panel discussion with local experts. Guardians, caregivers, and other caring adults are invited to attend. The film is appropriate for students 12+ as well. Check out a preview of Angst or see the Angst website for more information about the film. The annual point-in-time count of individuals and families experiencing homelessness is set to take place on January 24th. If you are interested in volunteering your time or supplies, your help is welcome. Volunteers are needed to conduct surveys, assist homeless individuals in navigating services, and conduct street outreach and surveys at scattered locations for 10 days after the count (the week of Jan. 28th–Feb. 1st). A Survey training will be held at the Rood Center in Nevada City on January 15th from 1:15 to 4:00 pm. The training is required for those volunteering to conduct surveys. To volunteer to conduct surveys, please email Scott Thurmond. To volunteer for Street Outreach, please email Brendan Phillips. To volunteer for the event at Interfaith Food Ministry, please email Phil Alonso. The following items are in high demand and greatly needed: socks, underwear, hand warmers, gloves, backpacks, sleeping bags, and hats. Nevada County’s annual point-in-time count of homeless individuals and families will take place January 24, 2019. 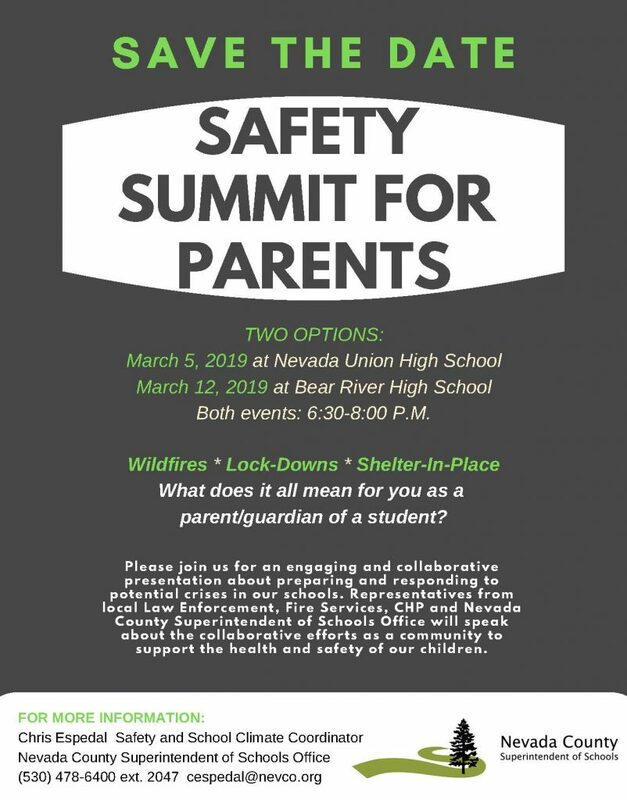 This year, Nevada County is holding events at multiple locations in an effort to meet people where they are. The three main event locations will offer food and a variety of other services for those who are experiencing homelessness. The point-in-time count is organized by the Homeless Resource Council of the Sierras. Homeless counts are required to receive funding from the U.S. Department of Housing and Urban Development. Though HUD only requires a full count of both unsheltered and sheltered individuals every other year, Nevada County now conducts a full count each year. This year, a number of Nevada County organizations are hosting events where volunteers will conduct brief surveys with homeless residents. 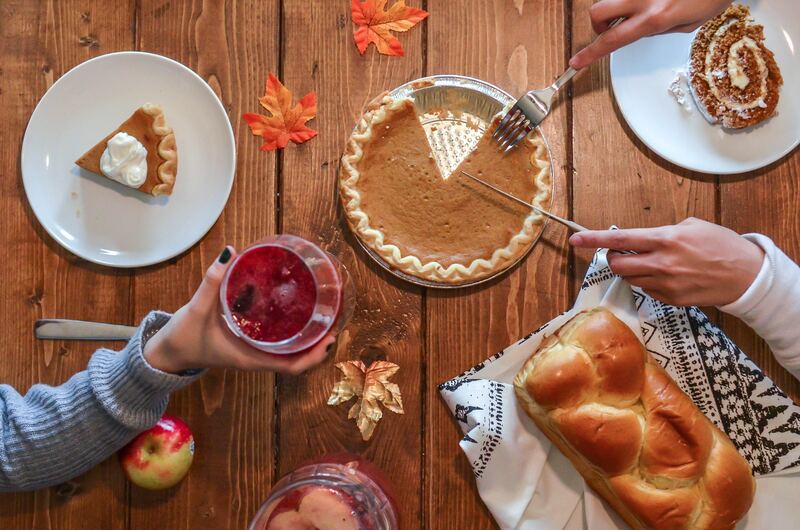 These main event locations will offer hot meals, clothing, supplies, and gift cards. Participants will also be able to connect with County services like CalFresh, CalWORKs, and Public Health programs. 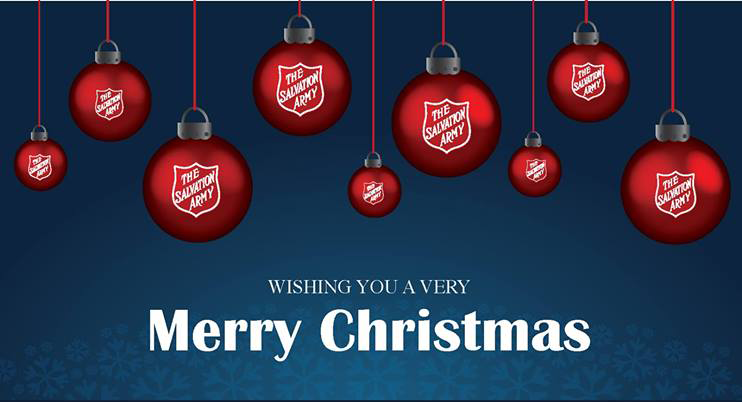 Community partners from across the county will also open their doors as alternative locations during the day to conduct surveys and offer gift cards. Cold Weather Shelters will be open on the night of January 23rd. In Western Nevada County, the Salvation Army and Hospitality House will be running vans to the Interfaith Food Ministry event from the Cold Weather Shelter Locations at 10:45 am. After that, the transport vans will work to coordinate routes between alternate locations, local parks, and areas known to be frequented by the homeless community. Volunteers and supplies are needed for the count. See our post for more information. 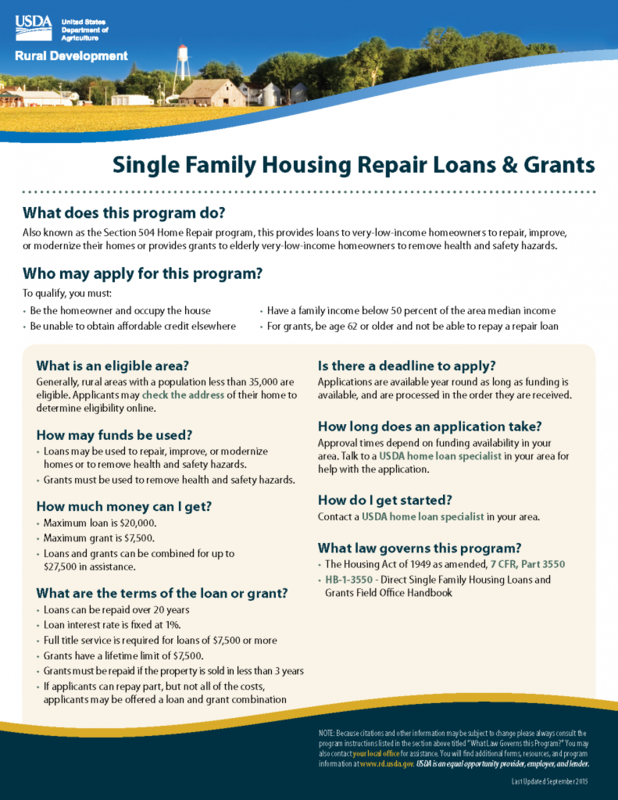 Nevada County Habitat for Humanity is holding two application information meetings this month for potential new homeowners. Habitat for Humanity homes are for families with low income who need better housing and are willing to partner with Habitat. Habitat homes are built by volunteers and are sold to homeowners at no profit, with a 0% interest mortgage. Application information meetings will be held on Wednesday, January 9th at 7:00 pm and Saturday, January 12th at 1:00 pm at the Grass Valley United Methodist Church. For more information, check out the flyer or call 530-274-1951. Childcare will be available by request. Please call 530-274-1951 to reserve your spot. Cost: Free. Call 530-274-1951 to reserve your spot. Having a criminal record can be one of the biggest barriers to obtaining employment or housing. Past convictions may no longer reflect who you are, but they are often the only information employers or landlords have about you. 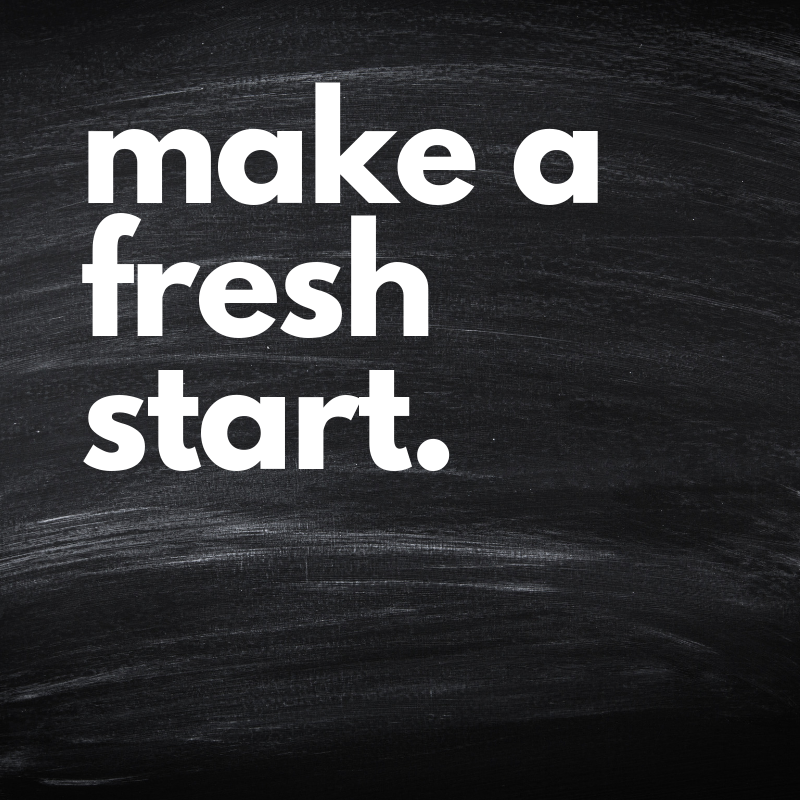 There is a way to get a fresh start, however. Both Community Legal and Legal Services of Northern California offer free record clearing clinics to help folks leave their criminal history behind. Community Legal holds a Record Clearing Clinic at 2:00 pm on the last Wednesday of each month. This free clinic is led by a local attorney who can assist you in finding out if a criminal matter can be removed from your record. 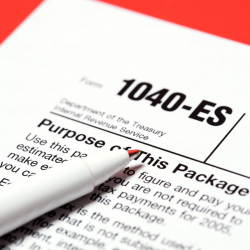 Attorneys will walk you through the process and may even go to court with you, if necessary. To reserve your spot, contact Community Legal by phone at 530-265-3425 or by email at staff@communitylegal.net. Legal Services of Northern California offers a Clean Slate Clinic at different locations on the first Wednesday of every month. Clinics are free and open to Nevada County residents. Attendees must have their RAP sheet in order to meet with an attorney. Please see the Clean Slate Clinic website for all eligibility requirements and instructions before registering. To register, contact Francisco Castro by phone at 530-886-4657 or by email at fcastro@placer.ca.gov. You must register to attend. Want to know if you have something on your record. Search by name on the Nevada County Superior Court’s CourtView website. You can learn your case number, status, and disposition and pay your outstanding fines online.